Payment for Classes in which you have enrolled can be made online using a Credit Card/Debit Card OR a Paypal Account if you have one. 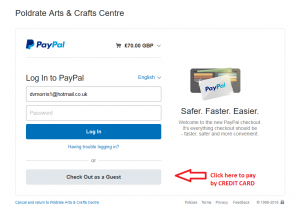 The payment is made through the Paypal payment service much in the same way that you might order a book or other item online though an internet shop. On selecting Buy Now you will be directed to the Paypal Entry Page shown below. 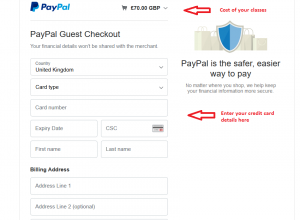 I have highlighted with a red arrow where you should click to go to Credit Card Payment without bothering to open a Paypal account. Selecting this button will take you to the following page where you can fill in your credit card details and pay.